DUBAI – The UAE could be the first Gulf country to implement a consumption tax. Earlier this week the UAE Arabic newspaper Al Ittihad claimed that the national government has drafted a plan to introduce a value added tax in an effort to raise revenues from sources not reliant on oil. The government has not yet announced the rate of the upcoming tax, however, it is known that the tax will be levied at a raised rate on luxury items, alcohol, and tobacco, but basic goods and everyday essentials will be exempt from the tax. There is not yet any timeline on when the new VAT can be implemented, as the law stills needs to be approved by Federal National Council, the Federal Supreme Council, and also signed by the President Sheikh Khalifa before being enacted. WASHINGTON D.C. – The UAE should implement a VAT, excise tax on vehicles and corporate taxes in order to reduce its reliance on oil. In a new statement issued on August 4th the International Monetary Fund called on the United Arab Emirates to implement new tax measures in order to create extra buffers against the volatility of oil prices. The main tax issues recommended were a 5 percent Value Added Tax and a 15 percent excise duties on passenger vehicles. It was also suggested the UAE should implement taxes on businesses, especially corporate income tax, as currently only foreign banks are obligated to pay an income tax, while other business face only a small number of municipal taxes. DUBAI – Dubai will use tourist taxes to raise funds for new programs and efforts to bring more commerce and visitors into the city. On March 31st 2014 Dubai will enact a daily tax of up to AED 20 to be paid by any tourist staying at local hotel or any other tourist accommodation, according to information released earlier this week by the state news agency WAM. It is estimated that the collection of the new tax, which has already been called the Tourist Dirham, could raise annual revenues by as much as AED 330 million, but this amount could increase, as the government currently expects the number of arriving tourists to rise by 11 percent this year, and to double from the current figures by the year 2020. 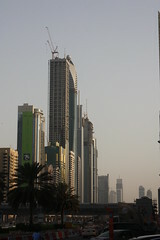 DUBAI – Dubai intends to lure more mid-range hotels into the city using a new tax break. While giving a speech at The Hotel Show in Dubai on September 29th the director general of the Dubai Department of Tourism and Commerce Marketing Helal Saeed Almarri announced that the government will soon drop the 10 percent municipality tax normally levied on the nightly rate of rooms in hotels in Dubai. The tax break will be granted only to three-and four-star hotels for a period of four years from the day that building consent is issued. Applications for the tax break will only be open for the next three years. DUBAI – The United Arab Emirates will not be implementing any corporate or personal income taxes for at least another two years, and proposals to institute a Value Added Tax system are equally far off into the future. During an interview on a local television channel on March 11th the Minister of Finance and Industry of the United Arab Emirates Hamdan bin Rashid Al Maktoum confirmed that the UAE will not see the introduction of a corporate income tax in the budget plan for the years 2012 or 2013, and said that the UAE also currently has no plans to impose any government service fees, and does not intend to implement income taxes on individuals’ incomes.